Chelidonium luteum Gilib. nom. inval. 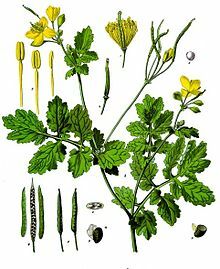 Chelidonium majus, (soladene, seladeen) is a yerbaceous perennial plant, ane o twa species in the genus Chelidonium. ↑ "The Plant List: A Working List of All Plant Species". Retrieved June 7, 2014. This page wis last eeditit on 6 Februar 2018, at 20:01.